ABRAHAM LINCOLN. Document Signed (“Abraham Lincoln”) as President, [Washington, D.C., ca. February 1, 1865]. Co-signed by Hannibal Hamlin as Vice President of the United States and President of the Senate, Schuyler Colfax as Speaker of the House, 37 of the 38 senators and 114 of the 119 Congressmen who voted for it. 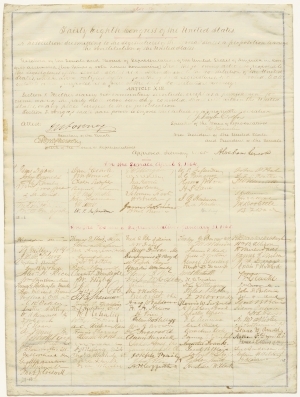 One of six or seven known “Congressional” copies of the Thirteenth Amendment signed by Lincoln and members of the Senate and House who voted in favor of the resolution [and one of thirteen or fourteen known copies signed by Lincoln]. 1 page, 20 5/8 x 15 3/8”, engrossed on lined vellum. This amendment, outlawing slavery and involuntary servitude, was the first change made to the Constitution in over sixty years, and the first substantive change to America’s conception of its liberties since the Bill of Rights was ratified in 1791. A Resolution: Submitting to the Legislatures of the several States a proposition to amend the Constitution of the United States. Ewd. McPherson and President of the Senate. In the Senate, April 8, 1864. Hale, John Parker Conness, John Howard, Jacob M. Willey, Waitman T.
Collamer, Jacob Chandler, Zachariah Sherman, John Anthony, Henry B.
Grimes, James W. Harlan, James Doolittle, James R. Ten Eyck, John C.
Fessenden, William P.* Brown, Benjamin G. Wade, Benjamin F.
In the House of Representatives, January 31, 1865. Stevens, Thaddeus Eliot, Thomas D. Pike, Frederick A. Pomeroy, Theodore M.
Van Valkenburgh, R. Jenckes, Thomas A. Kasson, John A. Tracy, Henry W.
Marvin, James M. Allison, William B. Miller, Samuel F. Longyear, John W.
Loan, Benjamin F. Hale, James T. Davis, Henry Winter McClurg, Joseph W.
Myers, Leonard Boyd, Sempronius Norton, Jesse O. Wilson, James F.
Morrill, Justin S. Rollins, Edward H. Thayer, M. Russell Deming, Henry C.
Worthington, Henry [?] Gasson, J. Knox, Samuel Littlejohn, DeWitt C.
Broomall, John M. Williams, Thomas Cobb, Amasa Kelley, William D.
Baxter, Portus Baldwin, John D. Orth, Godlove S. Shannon, Thomas B.
Ashley, James M. Morris, Daniel Hubbard, John H. Eckley, Ephraim R.
King, Austin A. Hutchins, Wells A. Nelson, Homer A. Hubbard, Asahel W.
Upson, Charles Dawes, Henry L. Gooch, Daniel W. Washburn, William B.
Kellogg, Orlando Beaman, Fernando McAllister, Archibald Sloan, Ithamar C.
Wilder, A. Carter Brown, William G. O'Neill, Charles Patterson, James W.
English, James E. Dixon, Nathan F. Colfax, Schuyler Odell, Moses F.
Ames, Oakes Frank, Augustus Rollins, James S. Farnsworth, John F.
Moorhead, James K. Woodbridge, Fred. Bailey, Joseph Steele, John B.
Webster, Edwin H. Yeaman, George H. Schenck, Robert C. Alley, John B. There are no known copies signed by each of the 38 Senators and 119 Congressmen who voted for the amendment. This document was not signed by Senator Benjamin Franklin Harding of Oregon; on January 30th, he had been granted a leave of absence for the remainder of the session. Senator William Pitt Fessenden, who by February of 1865 was serving as Secretary of the Treasury (he would submit his resignation on February 6 and resume a Senate seat on March 4, 1865), did sign this document, but did not sign the “Senate” copies. Representatives G.W. Julian, W.D. McIndoe, W. Radford, J.F. Starr, E. Dumont, and J. Ganson (though his name is penciled in), did not sign here.